Skin cancer is by far the most common type of cancer. Each year, there are more cases of skin cancer than breast, prostate, colon and lung cancers combined. Non-melanoma skin cancer (like basal cell carcinoma and squamous cell carcinoma) are more common, and usually less dangerous, than melanoma skin cancer. Utah leads the nation in incidence of melanoma skin cancers, and Summit County leads Utah. That means preventative measures, awareness and a proactive treatment strategy are essential when living in this area. Regular skin cancer screening exams can mean catching a skin cancer in an early and easily treatable form. 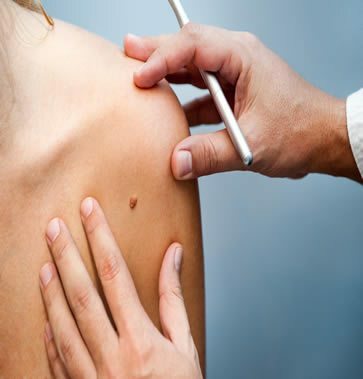 If you have a changing mole or are worried you may have a skin cancer, it is very important that you mention this when making your appointment. Sun Exposure: Both UVA and UVB rays are dangerous to the skin, and can be the cause of skin cancer, especially melanoma. Blistering sunburns increase risk, but constant exposure is also a factor. Moles: People with many moles, especially atypical moles, are at an increased risk of developing melanoma. If you have irregular and unusual looking moles, there is an increased risk of melanoma. If you see the first sign of irregularity or changes in shape, it is best to get them checked by a dermatologist right away. Family History: Any person who has an immediate family member diagnosed with melanoma has a fifty percent greater chance of developing melanoma. People with a family history of skin cancer should begin screening at an early age. Skin Type: People who have fairer skin are at risk of developing melanoma, as sensitive skin burns easily. Immune system: Any person with a compromised immune system has an increase chance to develop skin cancer. Skin cancer, including melanoma, is curable if detected early. You can prevent melanoma and non-melanoma skin cancer by protecting yourself from the sun and dangerous Ultraviolet (UV) rays. If you have a family history of skin cancer, then it is even more crucial that you take every precaution. To learn more about the dermatologic conditions that we treat, call our office at (435) 602-1918 to request an appointment, or request one online.